Have you ever wondered why microchipping is important if your dog is never out of your sight except at the groomer? I know I hadn’t given it much thought before. That is until I heard about someone being given the wrong dog back! Can you imagine? You drop off Spike to be bathed and groomed and when you get back, you are given Spock. If the other dog is pretty much identical to your pooch, you might not even realize it at first. We like to think we know our dogs, but honestly, if we’re talking two dogs that look exactly alike and someone says “this is your dog,” why would we assume it’s not? We just might think he’s acting a little different, but maybe he just had a bad experience and is adjusting. I heard a story just like that one time; a girl drops off her dog at the groomer and a few hours later picks up her dog. Only, it is not her dog. He seems to be acting weird, he is not going to people he is typically close to, and even nipped at her when she gave him table scraps! 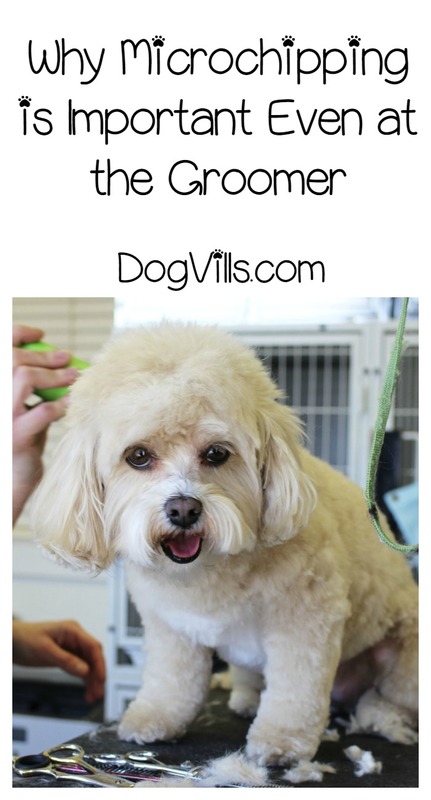 She chocked it up to a bad experience at the groomer and chose not to go back. Her dog’s behavior and the sudden change after the grooming was weighing on her, she made a call to the groomer… 4 months later! The groomer apologized and asked if she could return her call the next day. She asked her to bring her dog back to the groomer the following day. As it turns out, she had received a similar phone call from another dog owner, who said their dog had not been acting like himself. Ready for it? The groomer had mixed up the dogs. Mistakes happen and the groomer was trying to make it right, I am sure she felt awful. The dogs were returned to their rightful owners and I am assuming neither party ever returned. This is a great instance that explains why microchipping is important, even if you only take your dog to the groomer. The microchip, when scanned, will pop up the dog owner’s information and where he lives. Some people might think “My dog doesn’t run away, he always comes back when he is called, I don’t need a microchip” or “My dog is very noticeable, there is no way he could be given to another family by mistake.” It does not hurt your dog any more than a vaccine (which I am assuming you also get Fido so he doesn’t get any horrible disease, right). Think of microchipping as insurance should something happen to your furry family member. Think that story is a fluke? So did I, so I did some digging to see just how often it happens. Here’s another example, this one is far more heartbreaking. A quick search on Bing shows even more times that it happened, sometimes with tragic results. One Scottish woman lived with the wrong dog for a year! If you do happen to get back “your” dog and he’s acting weird, you can take him to the vet for scanning and clear up any mix-ups right away. When our pets act different, we usually talk to our vet anyway, right? It takes a second to scan the chip and verify that Fido is, in fact, YOUR pooch. We all want our loved ones to be safe, four-legged ones included. Better safe than sorry! Do you have a story that explains why microchipping is important? Have you checked out microchipping for your dog? Let us know your thoughts! Share your stories with us as well.